Airport Wireless Internet Connectivity System (AWICS) - Mentor Radio, LLC. Stay Connected to Wi-Fi with AWICS! AWICS, Airport Wireless Integrated Connectivity System, is a way to allow multiple paths for communications. Voice and data can be carried several different ways to allow users/workers to stay connected and have access to data regardless of workload or location. Data availability is directly related to accuracy. Lack of TIMELY data increases the possibility of errors. Correcting these errors can be expensive. The most difficult communication issues revolve around the individual when they are either away from their office or out of their vehicle, noise in the environment, weather and the availability of a free hand to operate a microphone. Getting information accurately to the correct person is the motivation for implementing such complex communication system. For business communications, many airports use handheld portable radios for this purpose. Some small airports are able to use handheld radios in simplex mode. As the distance increases or more airport infrastructure is built, this becomes more of a problem. To increase their limited range, handheld radios are usually configured to work with repeaters in Duplex Mode; a costly solution. It’s also more difficult to expand the system over time. Installing more repeaters may be problematic; using repeaters for data is sometimes not possible without equipment upgrades or replacement. Voice was the only way to send/receive data. Copying data from radio to paper increases the potential for errors as well. Mentor Radio’s solution is AWICS. AWICS carries voice and data, depending upon the type of radio connected to the fiber. When connected to Wi-Fi, AWICS extends the entire corporate network and all it’s internal capabilities out onto the ramp, taxiways and other remote airfield areas serviced by AWICS remote units. AWICS is easy to expand. Increase coverage area by adding nodes. To add a node, simply add a base unit to your network connection and run the fiber. Attach a remote unit and you’re ready to connect to the network. AWICS uses Radio Over Fiberoptic (ROF) connections to a Distributed Antenna System or DAS. The DAS converts a radio signal into light and sends it over a fiberoptic link to multiple antennas at many widely distributed locations. Each location converts the light back to a radio signal and radiates it. Since many antennas distribute the same signal to the same coverage area, a repeater can be realized, but at a small fraction of the power. Furthermore, many different radio frequencies can connect to and use the same fiber. With current trends in airport design and consumer electronics both moving at lightning speed to full digital integrated solutions. The question becomes when to move to broadband airfield data access, not if. AWICS overcomes many problems using radios alone or using Wi-Fi alone. AWICS implements a multiple antenna system such that the transmitter at the existing network connection (LAN/WAN) does not radiate transmitter radio frequency (RF) power. Instead the RF power is spilt into any number of paths converted into light and sent over fiber optic cable to remote units located at optimum user locations, (inside buildings, outside buildings and scattered around the airport grounds). All remote locations convert the light signal back into RF power and radiate RF from many points. 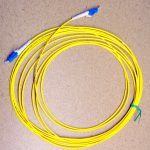 This system allows growing the coverage area by adding additional remote units and connecting with additional fiber optic cable. All this without obsolescing your initial investment or diminishing your original coverage. Planning for an AWICS system is important to ensure maximum benefits are realized. A small network is one in which there is a single connection point to the internet such as a cable modem or a DSL modem. Usually this component is connected to a single wireless router with a cabled PC that are connected to up to 4-8 RJ-45 ports for hardwired connections and the wireless port is used for all wireless connections. The wireless router may be configured for use with or without security enabled. For non-trivial data access, it is highly recommended to enable security at this point. When connecting to a small network like this you only need a low cost wireless router. It should support 802.11 a, b or g. This connection will require a circulator to connect to the AWICS base unit also. A large network is one that has a defined network infrastructure where a large number of users are needing to access data simultaneously. These networks can be configured to connect Access Point units to outside networks. Network administrators can determine if their networks require using Access Point units or if they can connect using a simple wireless router. AWICS allows connecting 1-N Access Points for any size network. Connecting AWICS to an Access Point unit does not require connecting a circulator. Each Access Point unit may be connected to 1-N number of base units/remote unit node pairs. For more information click on the links below.